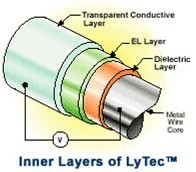 Bundled lengths of EL Wire spool ends etc. Short cuttings and spool ends. Lengths listed are continuous, uncut lenths. An 'Out of Stock' message indicates its been snagged! All Garage Sale EL Wire is priced at (US)$0.75/ft. If you find an error, please notify us.